Why Deadline Funnel + ManyChat? ManyChat is one of the most popular apps for creating Facebook Messenger bots that you can use in your ads and marketing. With Deadline Funnel + ManyChat, you can add authentic deadlines to your automated sequences in ManyChat - so that after someone subscribes to your ManyChat sequence you can let them know they have a specific number of days or hours to take advantage of your special offer. 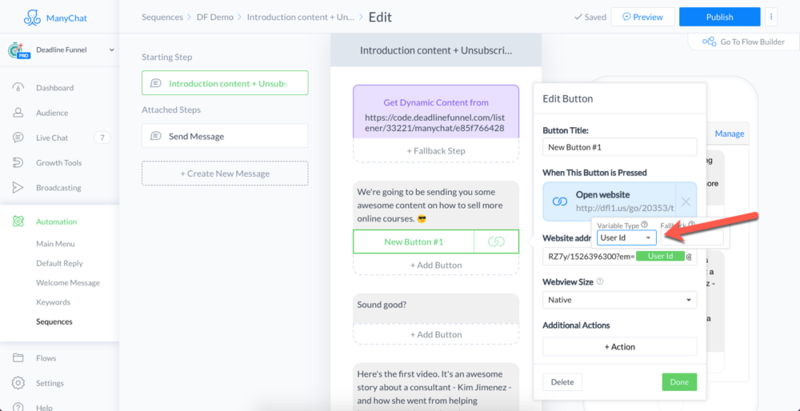 This guide also assumes that you already have a Deadline Funnel campaign created and that you will only be integrating this campaign with a ManyChat sequence - i.e. 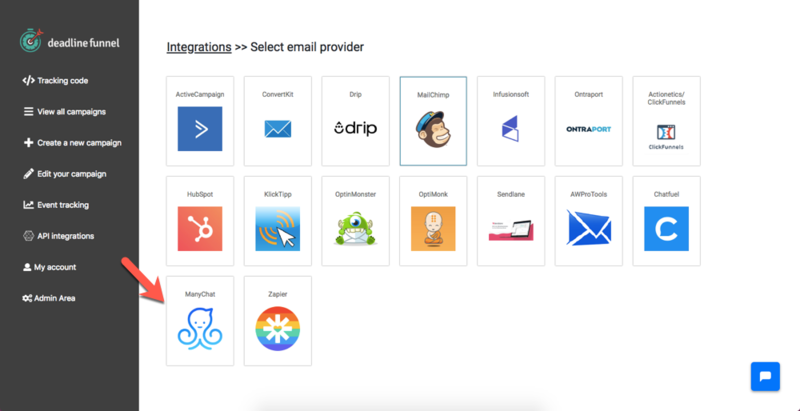 that you won't be integrating a single Deadline Funnel campaign with both a ManyChat sequence and an email sequence at the same time. 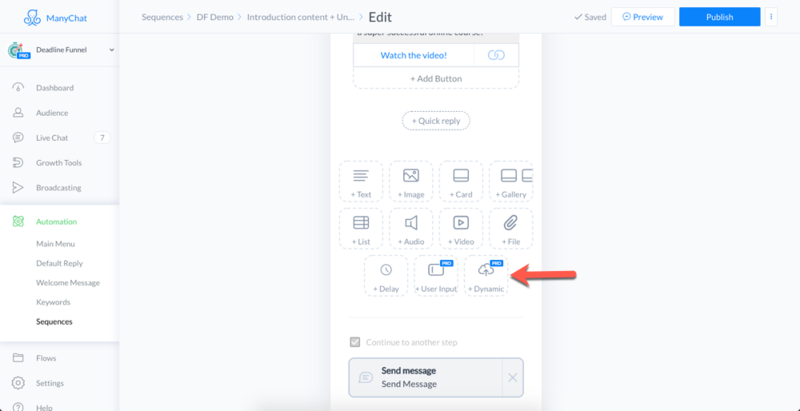 If you do want to use ManyChat and a regular email sequence at the same time, please use this guide instead. And if you have any questions along the way please contact us in chat (blue icon, bottom right corner of the screen) and we'd love to help! 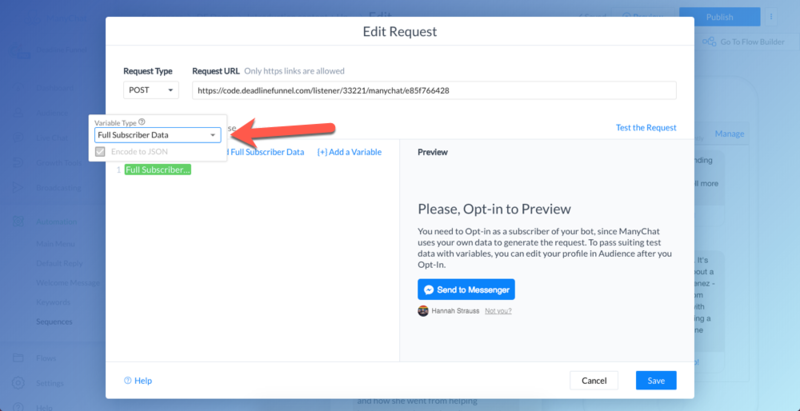 To integrate Deadline Funnel + ManyChat, you need to add the webhook to the top of your ManyChat sequence so that it can start a new deadline for each user as they interact with your sequence. Paste it into your ManyChat button and then add the "User Id" placeholder and "@mc.deadlinefunnel.com" at the end. 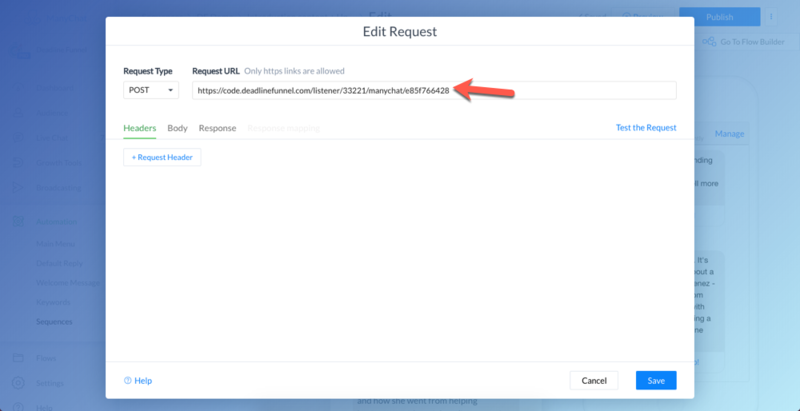 Now, whenever someone enters your sequence in ManyChat, their deadline will begin, and when they click on the Deadline Funnel email links in your ManyChat sequence, we will be able to make sure their tracking continues to be accurate - even on other devices and networks!